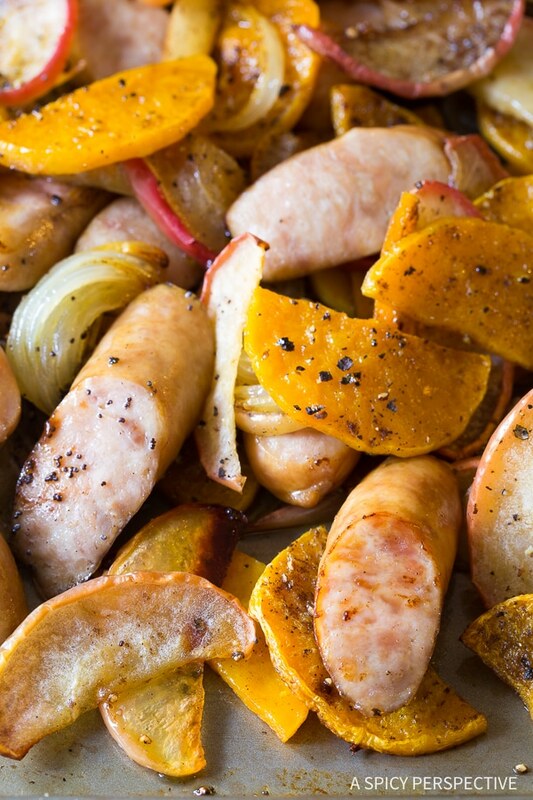 Chicken Sausage Apple Squash Sheet Pan Dinner – A quick 6-Ingredients One-Pan dinner recipe that is both comforting and healthy! Over Christmas break I re-read Laura Ingalls Wilder’s book Farmer Boy with the kids. We love to read the “Little House” books together, particularly around the holidays. And most of all, we love Farmer Boy, because of the rascally antics of young Almanzo, and the way he enjoys his meals. Laura Ingalls Wilder goes to great lengths to describe the dishes the Wilder family prepared in the mid-1800s. She does this throughout all the books pertaining to her own life experiences as well. Yet it’s the book written about her husband’s childhood that truly captures the value of every meal, from the perspective of a little foodie in the making. Almanzo was an appreciator of fine foods. It’s fun to read his detailed descriptions and reactions to various dishes his family enjoyed throughout the year. Above all the pies, candies, ice cream, and pork-laden dishes his mother cooked, Almanzo loved sautéed apples and onions best of all. 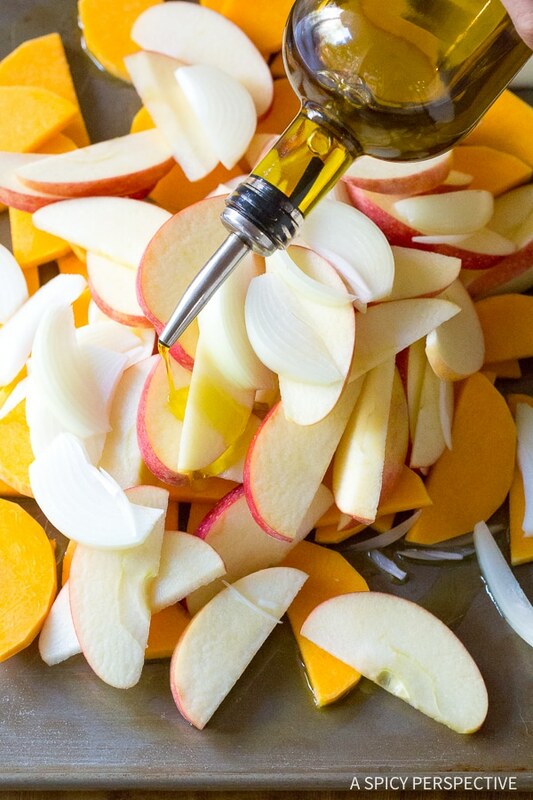 Pungent onions and crisp sweet apples are the perfect pair with softened together over time. Any other ingredient added to this delectable duo is bound to be enhanced by their mingled flavors. 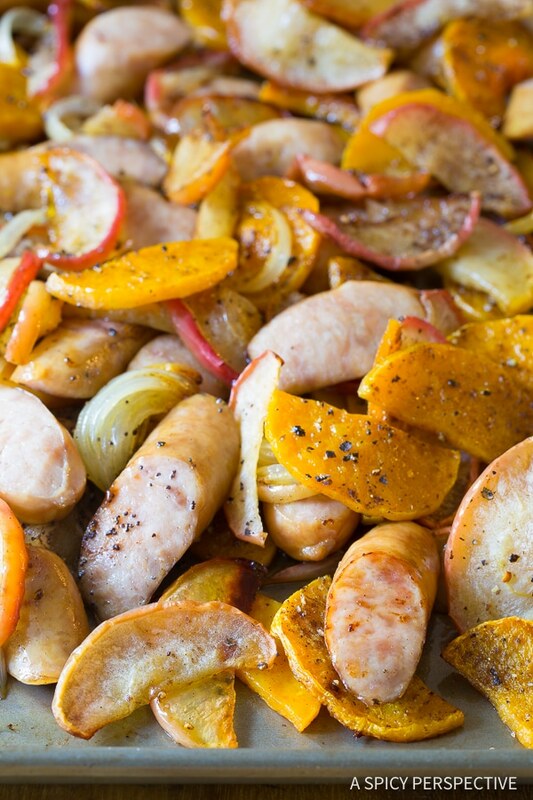 Today’s Chicken Sausage Apple Squash Sheet Pan Dinner is a rustic one-pan dish, combining butternut squash, lean chicken sausage, apples and onions, roasted together in the oven. Sprinkled with a little allspice, salt and pepper, this simple dinner idea captures the essence of hearty meals from eras past. 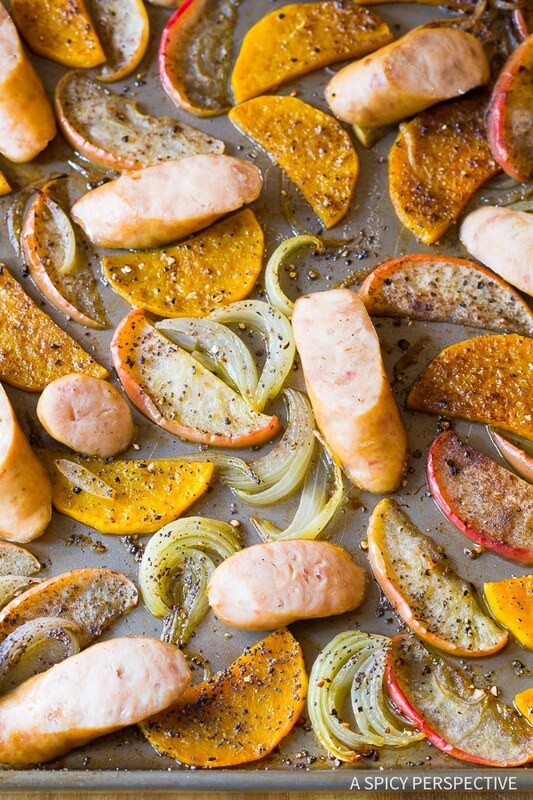 Honestly, I could eat this Chicken Sausage Apple Squash Sheet Pan Dinner every single week and never tire of it. 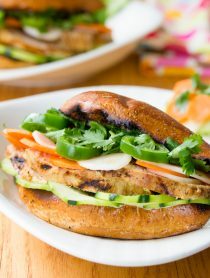 It’s such a comforting amalgamation, yet light and healthy with only 236 calories per serving! 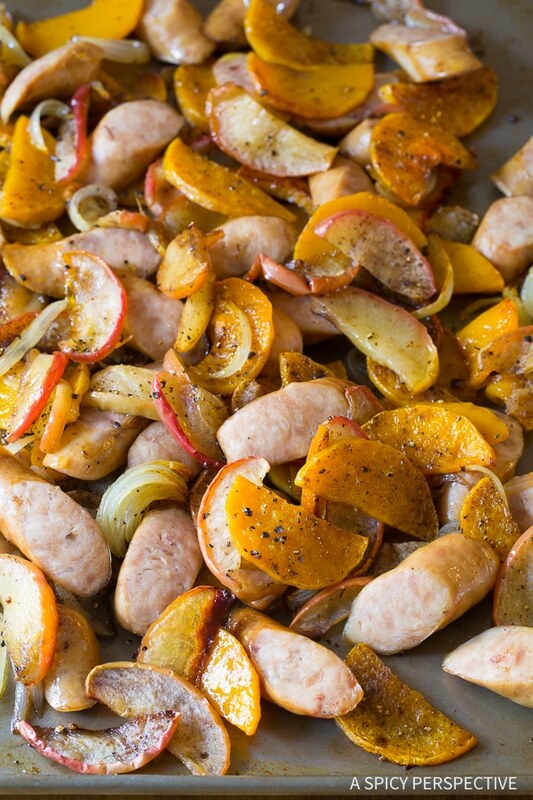 Chicken Sausage Apple Squash Sheet Pan Dinner - A quick 6-Ingredient One-Pan dinner recipe that is both comforting and healthy! Preheat the oven to 425 degrees F. Cut the butternut squash in half, lengthwise. Cut off the circular orb sections (the end with the seedpod) and save for future use. Peel the long sections of the butternut squash, then slice them into thin wedges. Core the apple and slice into wedges, unpeeled. Then peel and slice the onion into wedges. Pile the butternut squash, apples, and onions on a large rimmed 18x13-inch “half sheet” baking pan. Drizzle olive oil over the top and toss to coat. Then spread the squash, apples, and onions out into a single layer. Sprinkle with allspice, salt, and pepper. Roast in the oven for 15 minutes. Meanwhile, cut the chicken sausages on the bias, into 1/2-inch slices. 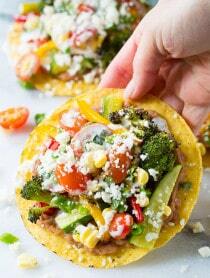 Flip the veggies, and spread them back out. Make room on the baking sheet for the sausages. Place the sheet back in the oven for 10-15 minutes, until the sausages are sizzling. Serve warm! Love any sheet pan dinner idea. 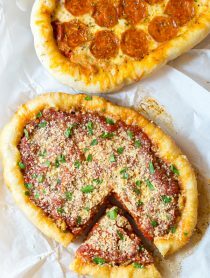 I am loving the everything about this dinner idea. The apples! The squash! Looks to be so full of flavor. A family favorite, we love all the flavors in this dish! Oh, how I can’t wait to try this!! Squash & apples are some of my favorites! Looks healthy & super tasty! A perfect weeknight dinner. Love how simple clean up is. Thanks for a great recipe. This recipe was good, but the butternut squash was still hard when finished cooking. I would cook the vegetables longer before adding the sausage. You can definitely cook them longer, but you shouldn’t need to if you slice them a little thinner. This looks delicious! I can’t wait to give it a try.